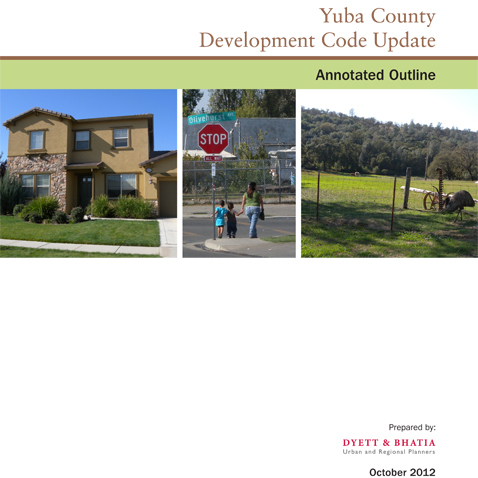 Through a Sustainable Communities Planning Grant, Dyett & Bhatia was retained by Yuba County to update the Development Code in a fully integrated, collaborative effort with staff to implement the new General Plan. The Development Code Update was coordinated with work on the Resource Efficiency Plan to achieve efficiencies in implementation. 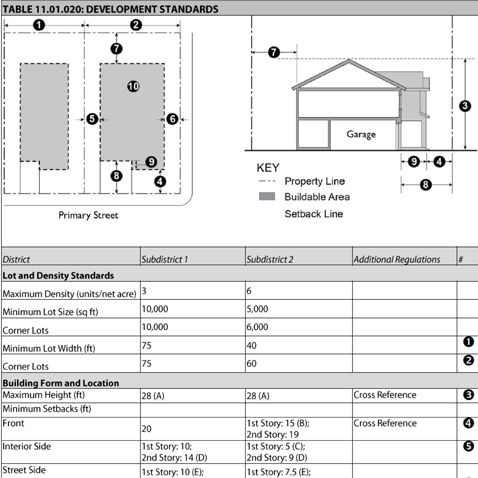 The Development Code update combined the County’s current zoning, subdivision, erosion control, grading/drainage, environmental compliance, improvement, and related codes and standards into a single cohesive uniform document that was adopted in June 2015. The contents of these codes was restructured to meet environmental and economic goals provided in the 2030 General Plan and to illustrate through design guidelines preferred approaches to development and open space conservation. The Update develops new standards that provide a more coherent sense of place, promote higher density residential development and commercial redevelopment in activity centers, preserve and enhance the character of rural communities, and support economic growth and agri-tourism.